During the German Revolution of 1848, many Turners sided with those trying to overthrow King Frederick William IV and establish a democratic state. When the revolution was crushed, those who rebelled against the monarchy were forced—or chose—to leave the country. Those German rebels who fled to the United States were called “Forty-Eighters,” and there were many Turners among them. Here they formed Turnverein Societies and built “Turner Halls,” which featured gymnasiums for exercise as well as auditoriums for dramatic and musical presentations. In America, Turnverein Societies attempted to preserve German language and culture in their adopted homeland. 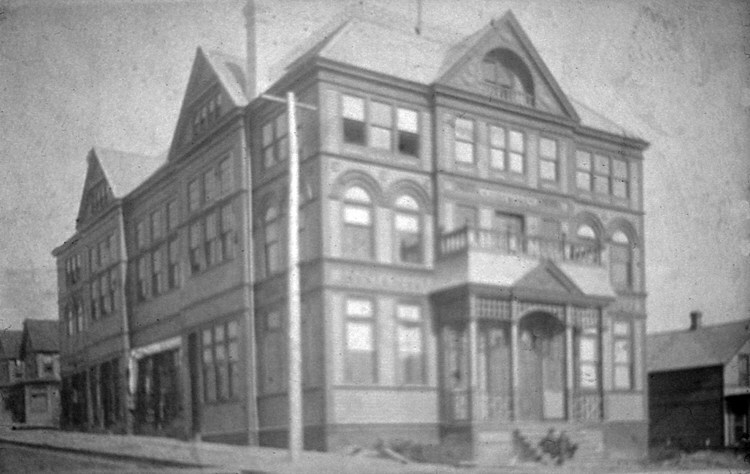 Duluth’s Turnverein Society first organized in 1873 by a group led by Charles Winckler and C. William Berkelman. Its constitution required that membership was limited to American citizens of German descent—at least eighteen years old—who could read and write German. If they paid a tuition fee, non-Germans were welcome to attend lectures and concerts and participate in gymnastic training. It did. Throughout the rest of the decade and the next, membership grew and the hall saw steady activity. Duluth’s newspapers reported the group’s vigorous activities: gymnastic demonstrations, lectures, musical programs, dramatics and dances. But in December 1886, it all went up in flames—literally. Turner Hall fell victim to the same conflagration that consumed grain elevators A and Q and the entire lower 300 block of east Superior Street. On November 1, 1887, Duluth’s Turners voted to build a new hall on the northeast corner of Third Street and Sixth Avenue East on the outskirts of Ashtabula Heights, Duluth’s first tony neighborhood. Here Duluth’s wealthy built massive Queen Anne-style homes, many designed by Oliver G. Traphagen. Across the avenue from the site stood the 1883 County Courthouse, designed by George Wirth and built by Traphagen, then Wirth’s construction supervisor. In 1889 St. Louis County would build a jail and Sheriff’s home adjacent to it, also designed by Traphagen. Duluth’s Turners hired him to design a $10,000 building. The new hall opened July 14, 1888, at 601 East Third Street. Like many other Traphagen designs of the time, it was a brick building in the Romanesque design. It stood three-and-a-half stories high and covered the entire lot from Third Street back to the alley. Inside—besides the requisite gymnasium and a large auditorium (which sat 700)—amenities included a library, kitchen, dining room, meeting rooms, and a saloon. In the end it cost the Turners $12,000, or about $300,000 today. The opening celebration was attended by Turners from across the state, but it did not go off without a hiccup: the gas company had failed to connect lines to the building, so oil lamps and candles had to be employed. After Reinhard’s orchestra performed, Mayor John Sutphin gave a speech, followed by another talk by local Turnverein president Dr. Hugo Speier. There were of course gymnastics demonstrations, and the celebration continued the next day with a picnic and an evening performance. Just two years later, on February 18, 1890, fire once again destroyed the Turners’ home. A strong north wind drove the flames, and low water pressure hampered the efforts of firefighters—at times the hoses produced little more than a seven-foot stream of water. Fire quickly enveloped the entire building; it was completely destroyed. Duluth’s Turners vowed to rebuild on the same site. By March 13 they began a campaign to raise $15,000 for a new hall. Besides Dr. Speier, Duluth’s Turners included many leading business and professional men: retailer C. H. Oppel, grocer (and founding member) J. G. Rakowsky, Fitger’s Brewery owners August Fitger and Percy Anneke, and James Dworschak, who published a German-language newspaper. Meetings concerning the new building were held in Fitger’s office. The Turners hired architect Frank Young to design a two-story brick building. It would be smaller than the one lost in the fire, but with similar features: a gymnasium, auditorium with stage, bowling alley, gentlemen’s smoking room and ladies’ parlor. The gymnasium would be surrounded by an elevated gallery so visitors could watch the exercises. Construction began in August and was complete by February 1891. The Duluth News Tribune reported that the opening celebration featured Minneapolis Turners demonstrating “clever turning feats” along with speeches, music, and refreshments. In 1903 the Duluth YMCA rented and remodeled the building for use as the Boys’ YMCA with appropriate staff and activities until 1916, when Julius Barnes and Ward Ames provided funds for the Boys’ YMCA building on the southeast corner of Lake Avenue and Second Street. For the next twelve years, records indicate the building sat empty. In 1928 the building was drastically remodeled for use as a service station and garage. In 1963 it became Bill’s Motorcycle Sales and Service, which lasted just two years. The building sat vacant until it was demolished in the mid 1960s. The lot at 601 East Third Street has since served as a parking lot. Despite fierce anti-German sentiment during the first and second world wars, 54 chapters of American Turners still operate across the U.S., with national headquarters in Louisville Kentucky.